Welcome to the fifth edition of our “Interior Styles Explained” series! For those of you who are new to our blog, we have created a series of blogs outlining the histories, differences, and looks of several design styles to help you incorporate them into your space. Today we’ll be going through Contemporary Design to help give you a clearer understanding of this simple and subtly sophisticated design style. Contemporary Style became popular in the 70’s, and was originally thought to be simply a blend of styles before it became recognized as its own. This assumption arose because the style does borrow quite a few elements of different styles: Modernism and Postmodernism motifs can be seen as well as ideas from other styles like Art Deco, Deconstructive, Futurism and many more! Simply put, Contemporary Design is ever-changing. It is a style that is always ‘in the moment’; using what is popular or used right now. There’s much confusion over the design terms “Modern” and “Contemporary”; often being used interchangeably despite being two completely different decorating styles. Although it’s easy to understand how someone could be confused, there are many differences that can help you figure out the design style. Modern spaces tend to follow a very strict guideline; it is a design style that was created in the 1920′s – 1950′s and does not change. Contemporary spaces, on the other hand, have many variations in their interiors, changing constantly to stay on the cusp of current design trends. Also, unlike Modern Design’s preference for natural or neutral colours, Contemporary Design has no problem swinging from one extreme to the other on the colour scale. Both styles feature sofas, chairs and ottomans with exposed legs that help give the space a simple, uncluttered look as well as reflective surfaces such as exposed metals and glass. However, while Modern Design tends to favour keeping the space a little warmer, Contemporary Interiors celebrate a bold starkness with sparse décor. When decorating your contemporary space, always remember that less is more! The bare space on walls and between pieces of furniture becomes as important as the areas filled with objects. The open space is just as, if not, more meaningful than the pieces you put in the space. Try to take advantage of the structural elements in your space. 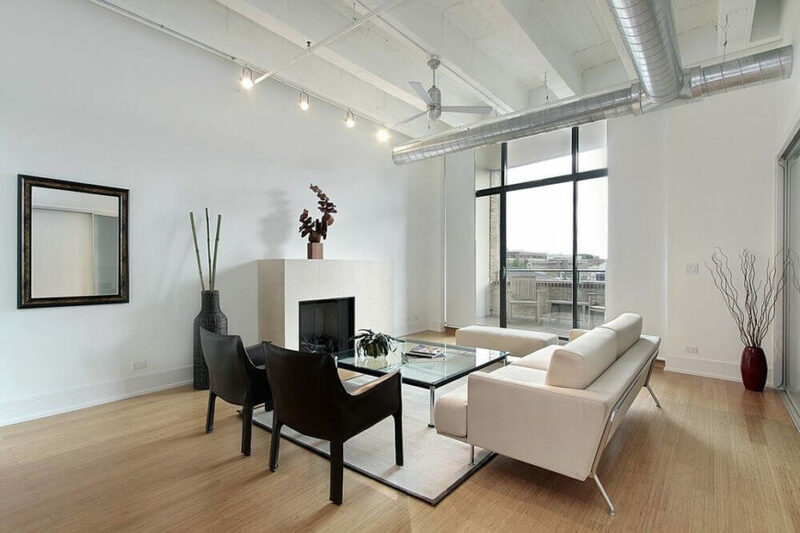 Air ducts hanging from the ceiling, exposed plumbing pipes, and broken bricks are perfectly acceptable in a contemporary style interior; providing texture and stability. To draw the eye, you can paint these structural details in bold contrasting colors, or diminish them by painting them to blend with the walls. Neutrals, blacks, and whites are the main colors in contemporary style interiors with bright and bold colours punching up the palette. 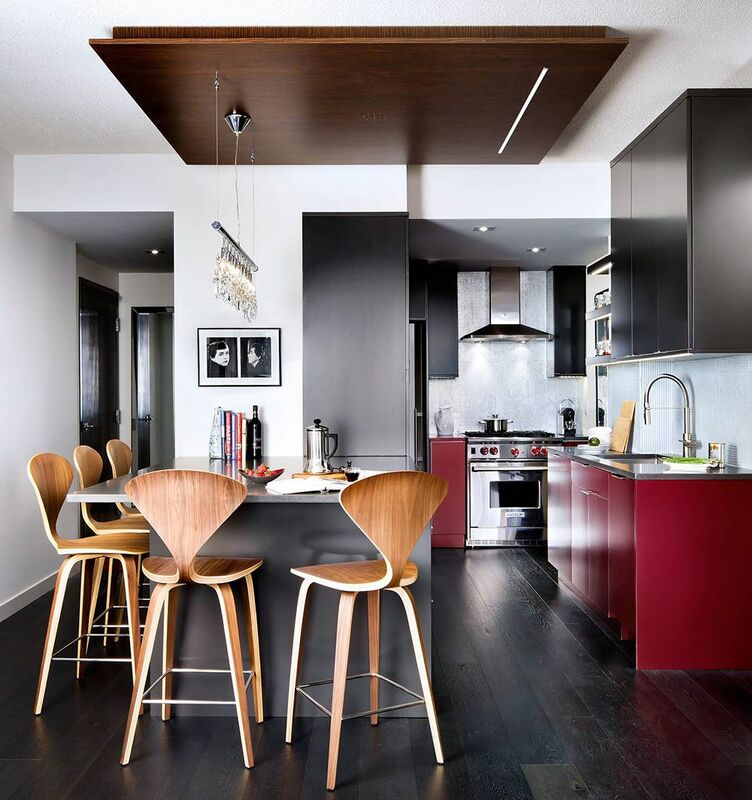 Be sure to offset your bold colour accents with neutral tones. For example, if your walls are painted in a basic neutral, you have a wonderful backdrop for bold coloured accessories and vice versa. Furniture pieces should make a bold statement but, at the same time, be a simple and uncluttered decoration. Upholstered furniture often has black, white, or other neutral tones with clean, geometrically-shaped pillows adding a shot of color and texture. Remember that in a Contemporary space less is more: furniture has no skirts, trim, fringe, or tassels. Get rid of cute and small; there is no room for ruffles, excessive carved details, or floral prints here. Think basic, bare, bold, and structural.